My playtesting has consisted of a few hours of practice a day on Cockatrice, with the bulk majority of it revolving around tuning my Mardu Midrange build. Additionally, one of my local game stores, Netherworld Games, held a proxy Standard tournament last Thursday which gave a nice peek-in to possible ideas going forward. The tournament was around 20 people and despite the small size most of the room had significant accomplishments under their belts. Multiple pro tour players, judges, and local grinders were all in attendance. It was a blast, and the decks were all over the place but definitely had a large amount of similarities to draw from and show what the format’s pillars will be. While I played Mardu that day to a 2-2 finish, I lent out a Mono Black Aggro deck that went 4-0, and there were several Mono Red lists present. I too had been working on Mono Red, just having trouble deciding which direction is correct so I plan to discuss some of the possibilities here. This was the list I initially had tuned on Cockatrice and played in the tournament. I beat a Mardu Aggro deck, a GB Reanimator deck, and narrowly lost to B/R Aggro and Mono Green Devotion. Both my losses were fairly close, and I should have likely won the Aggro one except I made a critical mistake in one of the games. If you’re just scrolling my article for decklists, do not copy the one above. The list had some very pertinent flaws. Online the manabase had been OK, but not stellar, and the mistakes fleshed themselves out over the course of the tournament. The creature package wasn’t performing either. If any of you have SCG Premium, you’ll note that BBD has been brewing a similar list and he came to many of the same conclusions that I reached. I just saw his article today and was nodding my head in agreement all the way down the line, so clearly these issues that I found were valid concerns. Cockatrice’s shuffler is also not perfect, so real-world testing gave me a second look at what needed to be done. Too much pain came from lands, too much mana flood / screw occurred. More scry was needed. 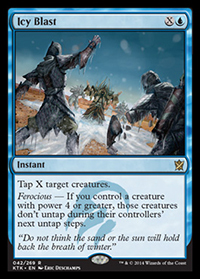 Ground beaters were largely ineffective when everyone is playing Courser, Fatties, and Midrange creatures. Evasion is very good, people largely had a huge issue with fliers. Hero’s Downfall is the most common removal spell to deal with this, and it’s only x4 of one card in most lists. Specifically, fliers with five or more toughness. Arbor Colossus was the answer from Green decks, and you could just kill him before he does anything. The deck had too many three casting cost spells, many of which didn’t stunt the early game of my opponents. Some cards were just not good in this build because they couldn’t get through, close the game, or weren’t as relevant to the format. Those cards were mostly: Brimaz, Thoughtseize, Soldier of the Pantheon, and Godsend. Thoughtseize is more complicated, so more on that later. Mardu Charm’s flexibility was great, but Hero’s Downfall was just better 90% of the time. 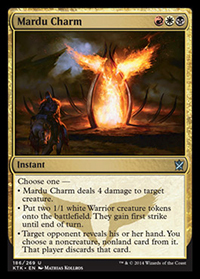 Mardu Charm is probably still worth having, but not as a x4 of for most lists. People love the modes, and I completely get that, but you just want to either kill all the dudes or kill THEE dude no matter who he is. Crackling Doom was incredible. This card is the new Blightning, and that is no lie. It needed to be maindeck. Pain Seer provided good card advantage, but the life loss was too much, especially in combination with the lands. He also just had moments where I couldn’t attack with him and he lost immediate value. Results improved immediately. The manabase was fantastic, and was largely based on suggestions from local pro Matt Severa. He was preparing a different deck for the upcoming Pro Tour in Honolulu, and I noticed some big differences with his mana in relation to mine. I talked with him for a while and he made some good points about how running 12 scry lands isn’t actually that bad because the deck doesn’t feature any early plays (or at least ones that are necessary to play on-time) and you can always scry away extra land or unwanted cards. In his other deck he was running a few tri-lands, but he said depending on the build they can largely be substituted as needed. So far in every game I’ve played online, I’ve hit my colors as needed and had no issues whatsoever. The scry lands have given the deck good staying power, and with running maindeck Anger of the Gods I’ve been able to haymaker most of the decks out there without missing a beat. Let me tell you, it’s very satisfying to cast Anger of the Gods and then drop any one of the creatures in this deck. Speaking of the creatures, I wanted ones that closed the deal. This deck needed to turn the corner faster, and cards like Soldier, Pain Seer, and Brimaz weren’t cutting it. 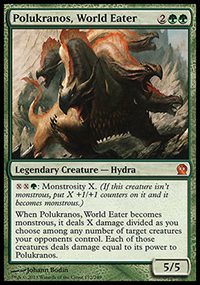 Since big fliers were punishing people at the tournament, I turned to the biggest ones available in Master and Sarkhan. 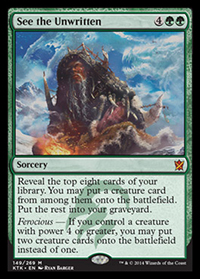 Some people are running both Sarkhan and Stormbreath, but I think that requires more ramp or a higher land count and ultimately running 7-8 five drops of that nature is guaranteed to create some awful hands. Master of the Feast has a pretty big built-in liability, but the card your opponent draws almost always has to be a removal spell for him or they’re busted. There are frequently board states where you have a Master and a Butcher, and your opponent is dead in two turns. That’s also assuming you haven’t Lightning Strike’d them, Crackling Doom’d them, or Rabble’d them, all of which do happen. All that said, I still am not sure on Master, so I began playing around with other options. He’s good against most of the non-black decks, but the decks that have Hero’s Downfall do have that as an answer and most of the time have Murderous Cut as well. When removal becomes plentiful, his upside goes down drastically, and he’s not great in multiples unless you are sure it will lead to a win the next turn. You can sac him to Butcher though, so your opponent can’t rely on a personal Howling Mine if you don’t want them to. Ashcloud Phoenix was one of the first options I tried out, again another suggestion from Matt Severa. I had dismissed him early when seeing the spoiler, but after further review I started to see that he could be a big annoyance to most opponents. The worst they can do is kill him, or exile him, but if they do the former you’re still getting a body out of him and later taking them to the dome for damage when he un-morphs. While he doesn’t have haste, a 4/1 body is no slouch, and you can even sac him to Butcher for value. It’s certainly not powerful enough to warrant the playset in most builds, but he’s a great miser if not a 2-of. Furthermore, it’s important that he’s one less mana than Stormbreath, as you’re already cluttered at the top end of the deck and only running 25 lands, even if 12 of them have scry. On the same topic of wanting more aggression, I added Lightning Strike over Bile Blight. While Blight is still a very sick card, not being able to kill four toughness creatures without trickery and not being able to go to the dome left the deck soft in many games. Strike is not a perfect choice, and I’m still playing around with it, but when Blight is mostly one-for-one’ing in the early format I think the burn route is a better one. 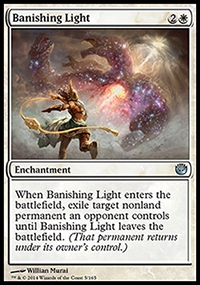 Moving Anger of the Gods to the maindeck also made it so that you didn’t need Blight’s effect, so the slot where Blight was can largely be filled with various options for the long or short game depending on your meta. The sideboard underwent some changes too. Nyx-Fleece Ram has been underwhelming, but I feel he’s pretty much a necessity against Jeskai Burn. I’m currently trying out Pharika’s Cure in the same slot, as it’s typically better against Aggro, but the Ram is better as a catch-all so he’s still probably still the correct choice. Thoughtseize is an enigma in this format. We all know why it’s good. It takes their best card, it protects your cards, and it’s as efficient as it gets. I GET that. But, it’s bad against redundancy, and in the case of this burgeoning format, that’s a plethora of fatties that all are basically the same (kill us or die!). It’s bad against these Mono Red and Mono Black aggro decks that are just unloading one-drops on you, and it’s bad against Control decks that have lots of burn which seems to be the flavor of the day. What it IS good against is your own mirror. The person trying to play Mardu Control, or Temur Control, or whatever variant you choose where they sit back with a few limited threats. For that reason, I’m still working on squeezing it in my sideboard. Despise is relevant in many of the same situations, so the end result will probably be a combination of the two, or four of one and one of the other. BBD made a good point in his recent article that leading with Thoughtseize into Rabblemaster feels like the old Thoughtseize / Pack Rat combo, but it’s not exactly the same and neither is the format. I often cast Thoughtseize only to reveal a sea of creatures that I’d much rather battle with a bigger and better one of my own (or race them). The decision to play it is probably the right one, but it’s a tough debate. I’d be remiss if my “Red Deck Winning” website didn’t talk about a Mono Red deck! I wish the results I’ve been getting were better, but it’s still hugely a work in progress at this point. There were several people at the Proxy tournament trying to crack the mold with Mono Red, but most of them went 2-2 or worse as I expected. It’s just very tough to play Mono Red against a field of Green Devotion, Sweepers, and potentially faster Aggro decks. Rabble Red lost some pieces, where Mono Black Aggro didn’t lose much at all and quite possibly is better now than it was. What Red does have though is Reach, along with a huge amount of cards that say “YOU CAN’T BLOCK” or “GIVE ME YOUR CREATURE”. WR Heroic was a top 8 deck at Pro Tour Journey into Nyx, and so far it looks like that’s the way you need to take Red. 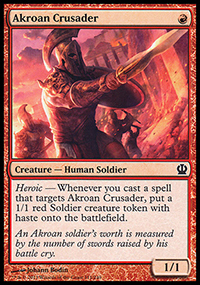 It’s a shame because there’s some truly good cards in Sarkhan, Phoenix, and Crater’s Claws that beg for a bigger build, but ultimately I think a lot of the other Midrange decks out there might be able to outclass you. I do say that with great hesitation though, because some of my “Big Red” builds have been testing well and this format is currently quite vulernable to Burn. Eidolon of the Great Revel is also just as great as he ever was, and I think people are forgetting he exists. I like Todd’s list, and I think it’s the foundation of where most early builds will be. 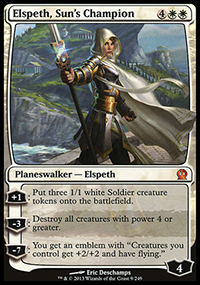 I personally haven’t been running Arena Athlete, and I’m still very high on Monastery Swiftspear, but ultimately it boils down to metagame guesses. I think the “can’t block” clause is the name of the game right now, and Todd respects that. War-Name Aspirant has been surprisingly strong in testing, and Mogis’s Warhound is an old standby from the BR Aggro deck I wrote about a while back. People also forget how good Dragon Mantle can be, especially if the format leans away from Control. That card can come out of nowhere and deal 5-10 damage if your opponent doesn’t expect it, and it gives you a great mana sink when you have nothing better to do. The strongest cards in the deck in my opinion are Titan Strength and Hall of Triumph, as a lot of people will be coming at you with sweepers expecting Mono Red in the early format. Mono Red always preys on early formats, and while I wouldn’t be surprised to see a top 8 berth at the SCG, I strongly doubt one is going to win. The tools “might” be present, but putting them together is proving awfully difficult. My two biggest problems with this list are the lack of Hammerhand and having only three Eidolon of the Great Revel in the board. Hammerhand has been extremely good for me, putting creatures out of sweep range, disabling blockers, and doing its best Madcap Skills rendition. Auras are not the type of card you’re particularly in the business of wanting, but I think it’s wrong not to play some number of Hammerhand as it’s just that good. There’s certainly room in Todd’s sideboard where he has x4 Magma Spray and x4 Searing Blood which seems excessive. If the format leans Midrange, those aren’t the correct cards, and while I love winning all the Aggro matches you put yourself in a liable situation everywhere else with that package. Cards like Peak Eruption have a true chance to shine going forward, as Mana bases will be greedy and so far average casting costs are going up. Normally I’d wait until a set was fully spoiled before starting to discuss it, but Khans looks so interesting already that I think we need to get started early. Theros was similar in my opinion, easily providing some of the most diverse testing I’ve seen along with a spring of new ideas that rejuvenated a lot of folks interest for Magic. While the Standard format has become incredibly stale, having eight to ten competitive archetypes is fairly unheard of and that bodes well for the future of the game. 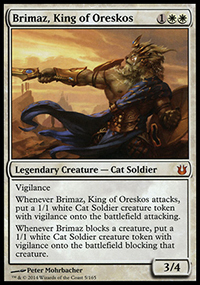 One important difference though between Theros and Khans is the direction of each set. Theros was a mono-color based block centered around strategies that required you to play a limited card selection (devotion, etc), whereas Khans so far is a multi-color based block focused on individual card quality. The latter breathes life into the ability to construct a wide variety of decks, which, while sharing some of the power cards, will each have a lot of nuances of their own. If you’re stuck playing one color, there’s only so much you can choose from, and the beauty of having both Theros and Khans be legal is that you could go either route in Standard and likely be competitive. Whenever any new big block set arrives, we have to look at what is rotating and then what the block that is staying centers around. The biggest hits from RTR/M14 that are leaving are Sphinx’s Revelation, Supreme Verdict, two mana spot removal for Black, devotion enablers (Boros Reckoner, Nightveil Specter, Ash Zealot), Mutavault, and the Shocklands. These were centerpieces for Standard that you had to build every deck either around or against. Thoughtseize is also in this discussion, but it’s staying put, so we only have to keep it in mind for building purposes. Creatures with a high toughness are going to be popular. X/4 , X/5s will be the staples of the format, so any aggressive Red deck will need to play cards that deal with those. 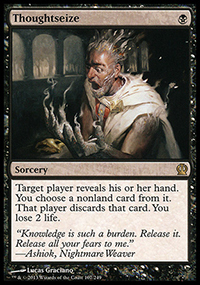 Whether that means a threaten effect, can’t block abilities, Stoke the Flames, Fated Conflagration, or Chained to the Rocks, you need to have access to it. B/G has most of the best cards. 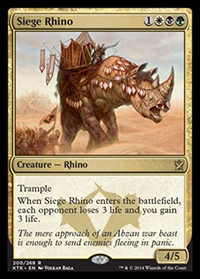 That’s also 2/3 of one of the wedges in Khans, so there will almost assuredly be many B/G/x decks. That means spot removal and fatties, so plan accordingly. Planeswalkers will be a centerpiece of the format, especially with few spells that answer them directly at an efficient mana cost. Khans is bringing some more, but you’re going to need dedicated hate for them because the ones above take over the game and so do most of the incoming baddies. Don’t forget, Planar Cleansing and Detention Sphere are also rotating, so this is really going to be free reign on just flooding the board with loyalty. And those decks are likely to include some of these “high toughness” creatures to block any attempts at reducing that loyalty, which stresses the need for hate even more since you probably won’t be able to attack through them. Red Heroic looks well positioned. It was a powerful deck at the Pro Tour and Tom Ross has been repeatedly beating face with it at just about every tournament around. Rabble Red has been a Tier 1 deck for the last few months, and it loses very little with rotation. The strategy gets underneath some of these more expensive cards, especially with some key removal pieces leaving the format, and there’s a lot of cards that can eliminate blocking for the simple cost of R. The biggest issues are of course mass removal like Anger of the Gods, Drown in Sorrow, Electrickery, and Supreme Verdict, but fortunately at least two of these are leaving. Your opponent also has to draw those cards, be able to play them on-time, and have you not play around them. That’s a lot to ask for, especially when you’re losing very little card selection and can play with those factors in mind. 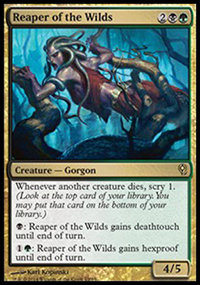 And best of all, the “wrath” card spoiled so far in Khans costs five mana. We all know four mana is the bread and butter needed by control to save themselves from the onslaught (if even that does it), so this will help immensely. While there are a lot of actual cards that are rotating on both lists, most of them aren’t critical or ones that can’t find replacements. There’s other one drops that were borderline playable, or could be substituted in, and there’s a lot of cards that did similar things (like Titan’s Strength and Rubblebelt Maaka). Obviously the stuff being lost will be missed, and did serve important roles, but Khans should bring at least one or two playables yet (still so much to be spoiled), and there’s a few Red M15 cards that might see action now that weren’t being played simply because the stuff rotating was just a small cut above them. The most important aspect to remember is this: If your opponent’s game plan is to cast a Polkranos, Elspeth, or Thoughtseize, redundant Red cards that cost a fourth of that are going to have a field day. I was pretty sure Sarkhan was going to be multi-colored and have marginal abilities, man does it feel good to be wrong sometimes. This guy looks fantastic. 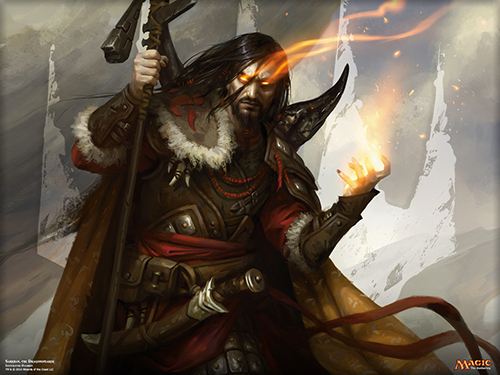 He passes a lot of “tests” for Planeswalkers which is the first area you have to start at with evaluations. His plus ability brings him to five loyalty which makes it pretty difficult to kill him with attacks or burn. 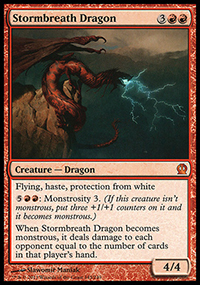 His plus ability turns him into a pseudo Stormbreath Dragon, which is already a powerhouse playable card. Sure, he loses protection from White, but there’s upside to counteract for that. He is indestructible in his plus mode, while at the same time “turning off” during their turn effectively eliminating most sorcery speed removal outlets. 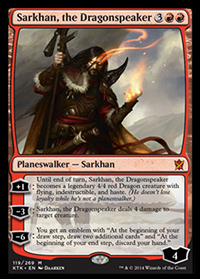 I believe Stormbreath Dragon is still going to be very good, but one of the things that seems to make Sarkhan even better is that he can kill creatures if that’s the mode that’s more important to you at the time. 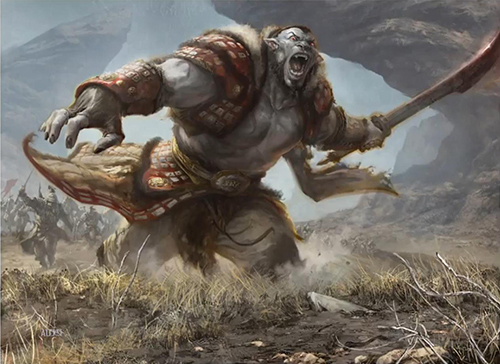 One of the big tests for Planeswalkers is if they can protect themselves or not, and not only does he do this but he also kills creatures with the almighty “four” toughness in this new format. His ultimate ability doesn’t kill them on the spot which is a shame, but it’s still powerful and likely would lead to a win shortly thereafter. Besides, I could easily see alternating between his first two abilities for the majority of time he would see play since they are the bread and butter of what you want to do in almost every game. And lastly, being a Planeswalker rather than a creature is another plus over Stormbreath Dragon since there is simply less removal in the format for that card type. I haven’t been this excited about a Red card in a long time, and the feeling appears to be mutual from just about everyone I’ve talked to. While he will need to be in a bigger Red shell, this guy is ready to start an inferno. Yes I know, not a Red card. But this set is just too sweet so I’m going to talk about other colors here too, especially since us Red mages will probably be dealing with these cards very soon. Anafenza is just all around awesome. 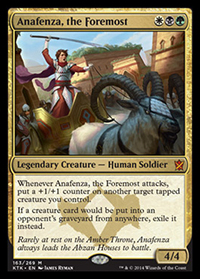 She can be an EDH Commander, she’s got an excellent rate by being a 4/4 for three mana, her first ability is pure value, and her second ability is relevant in many situations. I shudder just thinking about the games where someone plays this and then plays a Reaper of the Wilds the following turn. It almost feels like a card from the old Mythic Bant lists that were a giant force in Standard for a long time. She competes slightly with Courser of Kruphix at three mana, but there’s going to be a lot of decks that want both cards and she’s going to find more play in an aggressive shell anyway (rather than Ramp, although she’s still fine there). 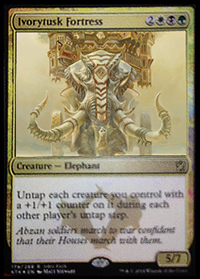 Loxodon Smiter was a great card in Standard, so I can’t see why she won’t be either. 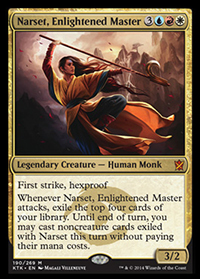 Narset may not be as eye-popping on paper, but she seems possibly playable, and is a fun card even if she only ends up being relegated to the EDH tables. The biggest knock on her is her lack of evasion and her base stats (3/2) which make her a hard sell at being a finisher for Control. Being able to protect herself and cast free spells in a deck largely filled with non-creature spells is a good thing to have, and I could see the biggest impact in a mirror match. Control mirrors often are dictated by who is able to play their lands on time and regularly along with having continual “gas”. She provides that gas, along with a threat. Midrange decks and Heroic Red aren’t bothered by her though, and this is where I think she falls short and thus may not catch on. 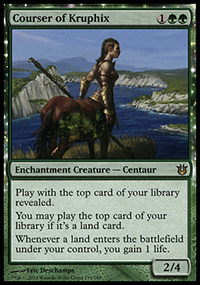 Maybe I’m just excited to build an EDH deck with her, who knows, but she looks sweet. Summoning Trap was a heavily played card in Standard for a while, and this card shares a lot of the same characteristics. I can see Ferocious being active most of the times this is cast, and the thought of having two absolutely game ending gigantic dudes enter the battlefield for six mana is absolutely frightening. Those “Souls” from M15 that weren’t being played before might just have met their red carpet. 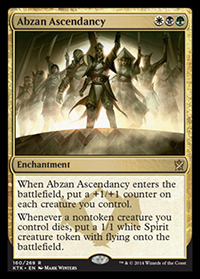 Abzan Ascendancy looks amazing, I’m extremely surprised this is not a mythic rare. I’ve already seen authors like Craig Wescoe discussing applications for it, but it should be obvious on paper why it’s so good. It’s a psuedo “Crusade” at a mana cost that is already acceptable in Standard for one (see Hall of Triumph), and it effectively wrath-proofs your creatures. Even outside of an aggro deck, this card is just extreme value at a minimal cost, and if my predictions on the format come true it’s in a color combination with some of the most powerful cards. You could even go deeper and setup a deck with a plethora of wrath effects and then nickel and dime your opponent to death with tokens provided by both the Ascendancy and other generators of yours. What it doesn’t do is provide a threat or defender at its mana cost, and that is always an issue, but the upside here looks far greater than any negative I can see at a surface glance. Goblin Rabblemaster anyone? 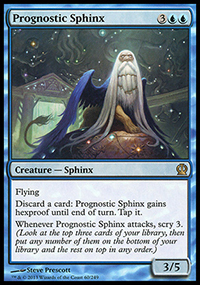 Stacking triggers with him or putting this in a Purphoros tokens deck looks like a blast, and if I’m reading this card correctly it could quite possibly be like a nerfed Spectral Procession on a stick which I can’t see being unplayable. 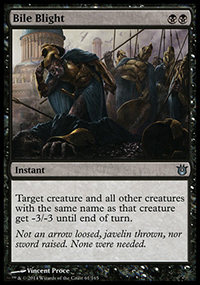 The second ability is a nice added protection clause against Anger of the Gods and Drown in Sorrow, but the main upsell here is that this card (much like Rabblemaster) demands that you deal with it or the board state or die shortly thereafter. 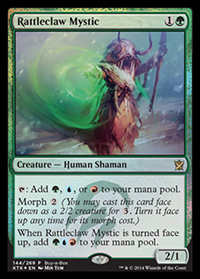 Temur Ascendancy might not have enough oomph to make it in Standard, but I wouldn’t be surprised if it does. You have one half of Hammer of Purphoros, and an exceptionally powerful ability for the other half. The color scheme is the only awkward part, but why all the wedges wouldn’t find homes in competitive decks is beyond me. Casting, say, a Polukranos after this, drawing a card, and smacking your opponent for five on turn four, is straight nutterbutters. And is anyone else noticing a trend? This card is yet another fantatstic EDH card. 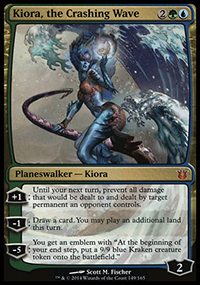 This card is a set too late (would have been sweet with Simic), but it’ll be a blast for EDH. I also feel like the fact that it’s one mana will get people to experiment in Standard, depending on how many enablers it has and how many do-nothings you can afford in your deck. I can’t remember the last time a charm wasn’t used in Standard (or almost every format for that matter), and judging from the exceptional abilities of these ones I don’t see that changing anytime soon. These all look great, and all seem like must plays in their wedges. 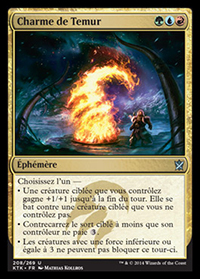 For reference, you can find the English translation for the one on the “Charme” one here – Temur Charm. For those of you who played when Shards of Alara was in Standard, you probably remember how fantastic that format was for draft and sealed. This set looks largely the same, with a bigger value upside, so I expect people to play this limited format for as long as it stays affordable. If you can’t tell from this article yet, yes, I am excited. I don’t know if this card is going to make it in Constructed. I wasn’t playing Standard for the brief time period when Morph was legal, so while I’ve played it in Eternal formats it’s always been a bit of a mystery to me. 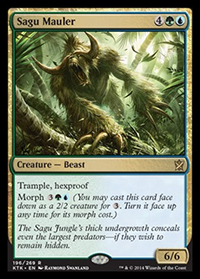 On paper, this card looks pretty good in my opinion, but I also think it will depend on how active people are at killing any Morph creature they see. It doesn’t have evasion, it doesn’t have protection, and it’s a common, so likely this is just a very solid limited card, but it’ll make games interesting nonetheless. I like that it’s a Human Warrior too, as that will enable it in archetypes that might need to stretch for playables. Efficiently costed, powered, and every ability is relevant. 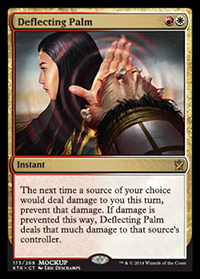 If this wedge has the potential for aggro, this card looks like it’s an auto shoe-in. Yes kids, it dies to removal. That’s never prevented anything from being playable so if you’re one of those who dismisses a card everytime you see something else in the format that kills it, please get over that evaluation issue or you’ll be the one screaming “I had all these!” when your opponent beats you down with this little guy. 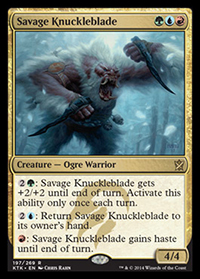 For me Savage Knuckleblade falls into the same category as Anafenza. Another efficiently costed creature with great abilities that looks immediately playable. If your opponent doesn’t kill this card the first turn it hits the battlefield, I don’t see many ways to deal with it. It dodges removal, it gets big enough to one or two-shot people, and it can give itself haste. This guy is super scary, and while he doesn’t have evasion the fact that late game you could just play him with haste and bounce him when they try to do anything looks pretty hard to stop. 10/10 for the name alone, Flying Crane Technique looks grossly powerful. The strange part will be trying to make a six drop work in an aggressive deck, but this might just be the top-end of a midrange deck that wants a way to push through board stalls. Even if it’s just a 1 or 2 of in the sideboard, it looks absolutely devastating and should end the game on the spot. And while I know I’ve repeated this ad nauseum (no pun intended), it looks like a wildly fun card for EDH. On the flipside, watch this card become a huge staple. I definitely see the potential for a big hit in the works. 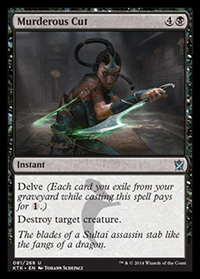 . .
Black has lost some critical removal pieces like Doom Blade, Ultimate Price, and Devour Flesh, so Murderous Cut might just “make the cut” (feel free to stop reading, I know, terrible). Any deck that wants to play this is probably playing Thoughtseize and Bile Blight, so that’s two cards already that are likely to be in your graveyard by the time you cast Cut, and assuming you’re running fetchlands this has now become a two mana Murder. It gets worse in multiples, but having this as a 2-of in combination with x4 Bile Blight and x4 Hero’s Downfall puts Black decks almost back to where they were before. At least Pack Rat and Mutavault are gone. . . 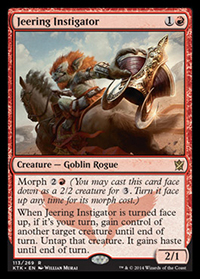 Initial thoughts are that Jeering Instigator is unplayable, BUT, I do say that with great hesitation. A surprise Threaten that can be played during your opponent’s turn is a strong effect in a color that always wants it. 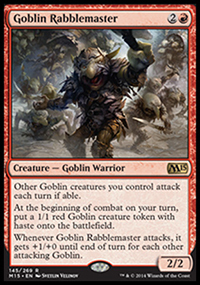 He’s also a Goblin which is probably being overlooked by most, but that’s important when Goblin Rabblemaster is one of the best Red cards in Standard. I could see a turn where he unflips, steals a guy, and pumps your Rabblemaster leading to game, set, match. Let’s hope that possibility is more reality than myth. Icy Blast reminds me of Sleep, except it’s an instant and it’s conditional. I think this card’s playability is entirely dependent on what finishers your deck runs, or just an acceptable game-ender in midrange strategies. It’s probably going to see play in this block in particular because of the fact that UWR Aggro has some strong options, but time will tell. Bottom line, there’s room for this if your build supports it. We have a lot of comparisons available for Rakshasa. Putrid Leech, Lotleth Troll, and Nantuko Shade were all Standard staples at some point in time, and while this might be the worst of the group it’s part of a strong design-type in a color combination that already looks strong. I say “worst” because this card can’t protect itself unless you have four mana or you take a risk and play it early hoping you buy a turn. That said, it can get really big, and aside from the first turn it’s tough to kill. The real question will be whether the mana cost or the mana intensity will keep it from seeing regular play, but I imagine it won’t. 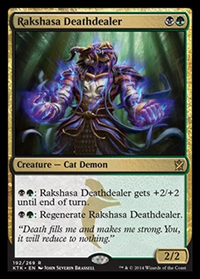 He looks like a good card, and he’s a Cat Demon which I’m fairly sure is the best creature type I’ve seen in Magic thus far. Aside from Phelddagrif of course. 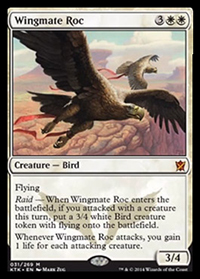 Wingmate Roc looks crazy! I hope there’s some hype getting built for this guy, because I personally believe he deserves it. He’s five mana for six power, both sides have evasion, he gains a ton of life if he lives a turn, and if he dies he made your opponent discard a removal spell and left behind an evasive creature with a high toughness. Sounds like a purely win-win scenario to me, and a great top-end to a midrange strategy. 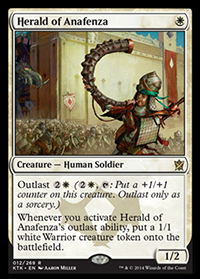 Herald looks to be the most playable of the Outlast cards so far, because a 1/2 for 1 is already OK, but generating tokens and +1/+1 counters is a great way to make him relevant later in the game (something most one-drops don’t have). I like the design, and I just hope that he doesn’t see the bulk bin on account of the fact that he’s not a 2/1. 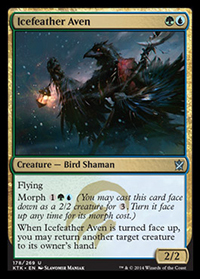 Icefeather Aven appears to be a great limited bomb, and I could see him being an interesting miser in Standard as well. The fact that there will be so many Morph cards in Standard will allow you to pull some Tom Foolery, and that is the name of this man’s game. He’s a tempo oriented card and he has the stats to do that no matter what mode you decide to play him in. 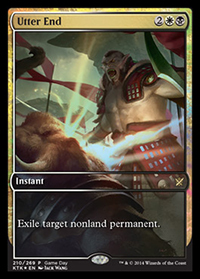 As some commenters on the spoilers pointed out, this is one more way to deal with Sarkhan (which is sad), but it’s also just a solid value card. 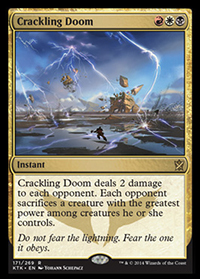 It reminds me a lot of Blightning, which saw immense Standard play, and in a format which I’ve discussed looks to be filled with giant creatures, it’s what the doctor ordered. 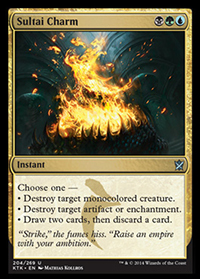 R/W/B is looking increasingly like the new “Jund”, so it will be an interesting journey to see what else comes out of the next set to support the color scheme. Its fragility is going to be the main factor holding it back from being a reliable ramp choice, but otherwise Rattleclaw Mystic might be in some dangerous builds. 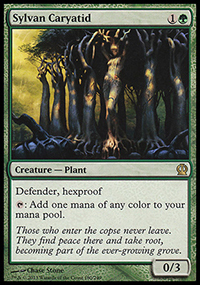 I can see a deck playing Sylvan Caryatid into this, followed by something gigantic the next turn. At the very least, this is my number 1 pick for FNM fun out of this set, I expect to see some hilarity ensue. Wow. As a Red mage, let me tell you I don’t want to see this thing. Incredible stats, an elusive five toughness, trample, and a six point life swing. I can only imagine when people start to blink this in and out of play. You’re essentially looking at “Thragtusk light” here. 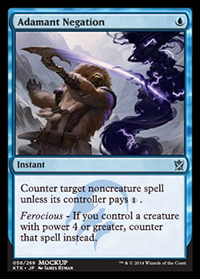 A very effective counterspell for blue, especially in a slower format like Standard where you are frequently only casting one spell a turn. There’s tremendous upside in decks that can support the Ferocious clause, and I’m expecting foil versions of this card will be in high demand. Still, some of the time it’s just a bad Dispel, so I’m fine with it being in existence. This pairs well with Monstrous cards, but outside of that there’s not much that will be in the format to make it exceptional. It’s definitely a card I could see being very strong once we get a few more sets out though, as the body is huge. Looks pretty fun for Doran EDH decks too. 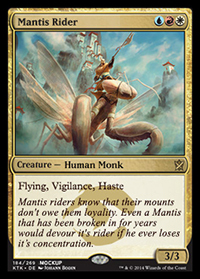 Wizards is really pushing for a UWR Aggro deck, and this combined with Mantis Rider is a capable force. 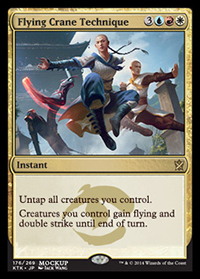 It’s yet another four toughness creature with evasion, and I personally would love to live the dream and cast Flying Crane Technique with this in play. 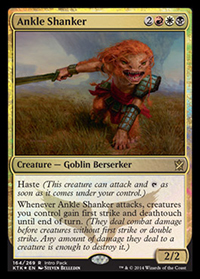 Ankle Shanker is pretty expensive for an Aggro deck, and I think it’s going to be held back by its low stats. It does however basically read “5 mana: Get a 2/2 with haste and make your entire team unblockable,” so for that alone I expect it to see play, just more likely in a Midrange shell. What I think is the most exciting part about this cycle of creatures is that each one of them is providing a way to get through a stall, and that is one of the most common problems with Midrange decks. It’s going to be a wild west atmosphere when each of the wedges has something that says “I win” at their disposal. 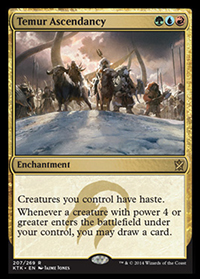 A limited Journey to Nowhere is still a Journey to Nowhere, and this in combination with Chained to the Rocks will give Aggro decks some effective cards to answer all the giant creatures in the format. 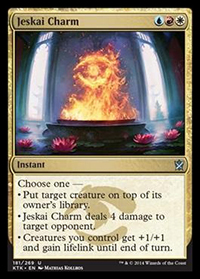 My biggest worry with this card is that the format is going to be “enchantment aware” since now we are going to be heavily relying on enchantment creatures. This could create a greater use of enchantment removal or more people including misers of those cards as an attempt to create big blowouts. This card’s condition is also easier to meet compared to Chained to the Rocks, so I’d imagine it will have application across more archetypes than Rocks has so far. Oh baby. Everybody loves clone effects, and this one looks like the grandaddy of them all. If this card doesn’t see play I will be amazed, and it’s one of the best card designs to come along in a while. Any game where this gets played is immediately going to be more fun, not to mention the shenanigans I expect to see people come up with. In Standard, this has to be one of the scariest cards if the format ends up being a compilation of various Midrange wedge decks. Like any clone the biggest risk is that there may not be anything relevant to copy, but I’d expect that more often than not it will just be incredible. Copying your opponent’s Garruk? Sign me up. 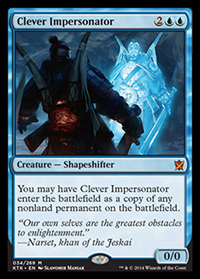 I initially had a positive reaction to this card, but saw it get a lot of flack online when it was spoiled. After looking over it for a while, I think the fact that his first ability doesn’t do anything on an empty board combined with the fact that you’ll have to go back and forth between his first two abilities rather than support his ultimate will limit his play. 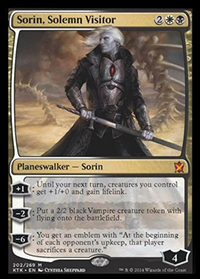 He seems like a very solid 1-2 of in Tokens or Midrange, or as a curve-topper in some kind of BW Aggro deck, but he’s not like the Lord of Innistrad version which allowed you to apply continual pressure regardless of the matchup. 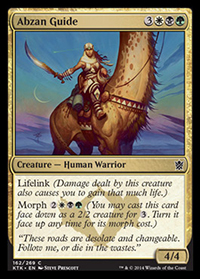 Lifelink is nothing to sneeze at though, and he’s aggressively costed with a high loyalty count so he should be involved in Standard if BW proves to be a strong combination. 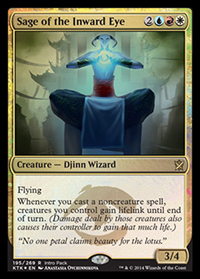 His plus ability also combos nicely with Elspeth, Sun’s Champion, which was easily the most powerful card in Theros Block Constructed. Syncopate + Fireball for one mana more is an intense combination. This card looks great because of how flexible it is, you don’t need a dedicated control deck to run it. 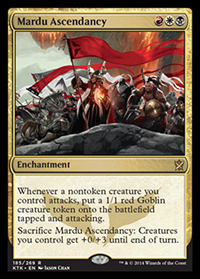 I don’t see why any deck with access to these colors would not want this card, as it’s a fantastic finisher and early game can stop cards on critical turns (aka the big 4/5/6 drops of this new format) Rakdos Return saw play for similar reasons to why this one will, and I personally think Mindswipe will have a much bigger impact since an early counterspell is often more important than discard. Additionally, if that UWR Aggro/Midrange deck materializes, this is a perfect answer to board wipes or other cards that could counteract your strategy. I don’t see it as a 4-of, but definitely 1-2. I think the key for this card is not necessarily that it has the ability to kill just about anything (note Planeswalkers), but that it’s an instant. For whatever reason, Dreadbore didn’t see a lot of play (especially compared to Hero’s Downfall), and I think the main gripe was that it was a sorcery. Utter End is costly, but its flexibility on all fronts will make it a format staple. This is another card that I’m absolutely sure will be a big one in Standard, and I know the cow jokes will be milked to the utter end of the format. 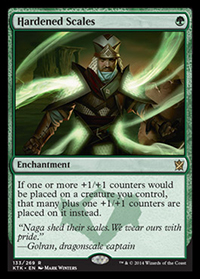 These type of effects rarely see much play, but they are great misers and sideboard options. 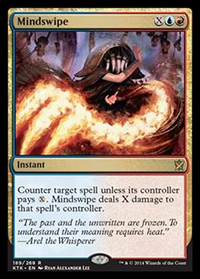 This is a sweet hose in the mirror, and although you probably would just want to have a burn spell or creature instead, I could see someone just wanting to have a more flexible 75 and running this. I’d almost never maindeck it, but I wouldn’t fault you if it was in the board. The mana cost is pretty high and he can be countered, but otherwise Sagu Mauler looks like an ideal creature to ramp into, or morph into if you’re playing against a Control deck. There’s not much that effectively gets in the way of a 6/6 trampler, and when you can’t target this with removal spells things start getting grim fast. He seems to compliment a heavy creature strategy well too, as providing additional bodies to prevent him from dying to Grave Pact effects will make him everything but wrath proof. I really want to see this card be played, it will just depend on the speed of the format. Good luck to all of you who will be attending the pre-release. My all-time favorite draft format was triple Shards of Alara, so I’m looking forward to basically a return of that with Khans of Tarkir. This set is both competitive and Commander heaven, can’t wait to break open the goodness. . .